LOS ANGELES — In what was arguably their best played game of the season, and their first home game of the season, the USC Trojans suffered a heart-breaking 13-12 overtime defeat to Boston College on Wednesday. The 12th-ranked Trojans have struggled to gain traction against a tough schedule in the early part of this season, including a 9-5 loss at No. 8 Northwestern on Sunday. Wednesday’s match against No. 4 Boston College (8-0) was the Trojans’ fifth in a row against teams currently ranked in the Top 15 of IWLCA Division I poll. Heading into the game, the Eagles were undefeated and had beaten USC in each of their three previous meeting, including eliminating the Trojans in last year’s NCAA quarterfinals. Needless to say, USC (2-3) went in with something to prove. The Trojans scored first on a goal from Maeve McMahon, but the Eagles answered with three in a row to take a 3-1 lead. 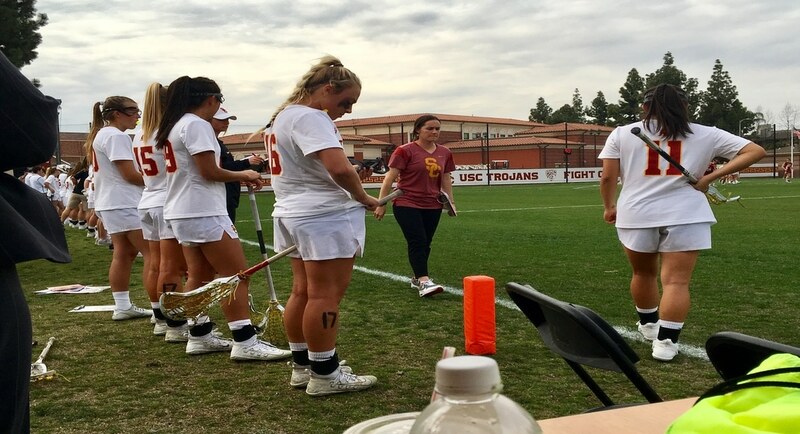 When USC pulled even on back-to-back goals from sophomore midfielder Kerrigan Miller and freshman midfielder Kelsey Huff, it signaled that this would be a tight, back-and-forth affair. Miller would finish with five goals for the Trojans, matching her career high by creating plays and breaking down Boston College’s defense in all sorts of ways. After falling behind 5-4 with six minutes left in the first period, USC pulled even again on a goal from Huff, then took back the lead with five seconds left in the half on a goal from Miller. The second half saw even more action with the teams trading goals and neither able to open up a comfortable cushion. At the 19:06 mark, Boston College matched its biggest lead at 10-8 on Sam Apuzzo‘s third goal of the game and 37th in eight games this season. However, the Trojans showed their resiliency one last time, battling back and actually taking a 12-11 lead with 6:30 remaining on a goal by Izzy McMahon, her second of the game and seventh of the season. USC managed to hold off the Eagles for nearly the next five minutes until a late flurry that included a save by goalie Gussie Johns on a free position shot — one of her seven saves in the game — and an Eagles shot off the crossbar. But Kaileen Hart picked up the ground ball off that rebound and eventually found Tess Chandler for the tying goal with 1:18 left in regulation. Chandler wasn’t finished, either. In the overtime, it took the attackman only one shot to seal the deal for Boston College and hand USC its fist home loss since April 2014. Munday said the Trojans have some consistency issues to iron out, but she is proud of how hard her team competes.